With the value of Bitcoin reaching almost 3k dollars in June 2017, one could reasonably assume that the investment appeal regarding this cryptocurrency definitely remembers some better days. Cloud mining is also suffering due to the high influx of cutting-edge ASIC miners and the ever-increasing mining difficulty. So, this BTC Robot review focuses on the potentially lucrative alternatives to those endeavors. One of the solutions lies in trading cryptocurrency rather than mining it. Automated trading robots are designed to help you hold your own in crypto exchanges, even without previous stock trading or Forex experience. 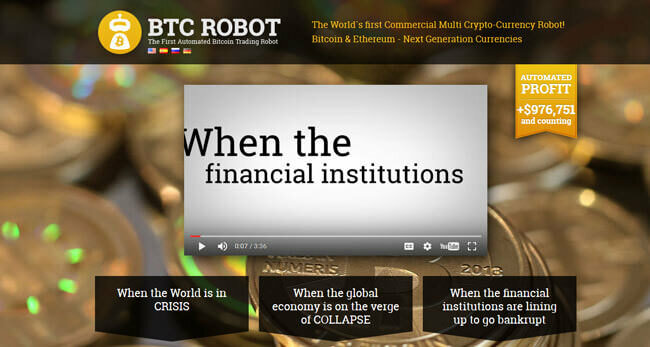 BTC Robot claims it is the world’s first automated Bitcoin trading solution. Its engine trades cryptocurrency on options platforms, seeking advantages through directional changes. Note that the creators of BTC Robot implemented Bitstamp a while ago, replacing the old trading strategy reliant on data from MtGox. Circumventing the MtGox liquidation proceedings made the software both profitable and fully functional on the likes of BTC-E crypto exchange. The system has been operating for more than 2 years now, but it’s currently being relaunched due to Bitcoin performing exceptionally and accruing higher value as a traded commodity. The creators of the platform are as cryptic as it gets, providing no information on themselves or their developer team. So, we don’t effectively know who really stands behind “Stefan H + Mike S.” BTC Robot’s Twitter page names Australia as their official location, which concludes the sparse list of information we have at our disposal. 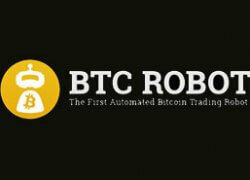 As mentioned in this BTC Robot review, BTC Robot is an automated trading software capable of executing trades on auto-pilot, without any human intervention. It can operate 24/7, constantly examining market prices. This enables it to exploit potential gaps via hedging techniques, capitalizing on substantial daily fluctuations, especially on weekends. Automated trading solutions usually rely on a specific market indicator (EMA, for example) in order to pinpoint the perfect moment for optimal profit generation. BTC Robot, on the other hand, employs a different approach. It examines the current prices in contrast to each other and compares them to the ongoing exchange rate at BTC-e.
Download – The prerequisite to utilizing BTC Robot is, naturally, creating an account with the Bitcoin trading exchange of your choice. You’ll also need to deposit a seed amount of at least 100$, which is a true breath of fresh air, taking the usual 250$ norm into account. Install – After the initial step, you can simply activate BTC Robot and let it do your trades for you. You’ll just need to set the permissions through your unique API key and set up a key number and a password. You can choose between the pre-installed VPS version or the Windows version. The VPS iteration rids you of complicated configurations, as it comes fully pre-installed within your personal browser-based members’ area. Withdraw your profits – We believe this step doesn’t require further elaboration. Silver Plan (149$) – This is a one-time license fee, without any additional monthly charges. This option is best suited for users who prefer to do their trading from their own computer. Gold Plan (248$) – This plan is a one-time payment for a 1-year membership, without any additional monthly fees. The package also includes a VPS, expedited ticket support, and a year of premium trade hosting. Platinum Plan (498$) – The package includes a lifetime membership with 3 years of VPS cloud hosting, expedited ticket support, and personal 1-on-1 support. Tip: With VPS cloud service, you don’t have to turn your computer on in order for BTC Robot to operate. It’s very difficult to end this BTC Robot review by definitively answering whether BTC Robot is a scam of some sort or not. The typical signs of fraud just aren’t there, but there’s enough to make us somewhat suspicious. We’ve received numerous reports, however, showcasing examples where users indeed made money off of it, but no large amounts were ever brought up in the context. BTC Robot and automated traders, in general, are made for people who’d like to raise the inherent gamble factor of cryptocurrencies to a new level by entrusting their trading strategy to a pre-programmed computer algorithm. This has its pros and cons to be sure, but at around 250$ total, the breakeven point is easily achievable, making it not that much of a gamble to begin with. Pretty simple to set up and it does all on its own, so no complaints here. All works as it should basically but I expected way more profit out of it.